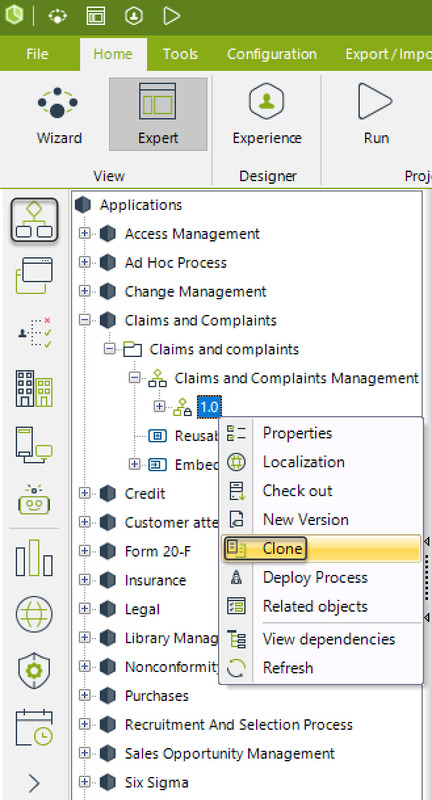 1.Bizagi will duplicate the process components such as Forms, Policies, Expressions, Vocabulary, Templates and elements in every process clone created. 2.Bizagi will only clone the chosen process version; other versions will be ignored. 3.Both Processes will be independent from each other. It means that none of the Processes will be affected by the changes made on the other one. 4.By default the cloned process name will be: "Copy Process Name"
1.From the Expert View select the Processes tab, then right click on the Process version and select clone. 2.A Pop-up window will display the structure of the application containing the processes. Select the exact version of the Process that will be cloned and click on Clone Process to start creating the new Process. 3.A warning message will display. Click in OK.
4. A Pop-up window will display showing the status of the Process. You are now allowed to work on the cloned process from the Wizard and Expert View.